Hiss at Tom Cruise’s psychopath in the back of Jamie Foxx’s taxi cab when he plays a mercenary on a merciless mission. Collateral is the first screenplay by Aussie writer Stuart Beattie and it’s a ripper. Originally titled The Last Domino, Beattie dreamed it up at the age of 17 on a cab ride from Sydney airport. After going to Oregon State University he got it developed and it later earned him a BAFTA nomination. He’s since gone on to write Australia, The Bra Boys and Tomorrow When the War Began which he also directed. Credited with writing ‘characters’ in all the Pirates movies, he gives us ones rich in detail and precision here. The location is Los Angeles where taxi driver Max Durocher works a regular shift. His penultimate passenger on this particular day is Annie (Jada Pinkett-Smith), a stressed out US government defence attorney who takes a bet with Max that he can get her to her destination faster than on her proposed route. It’s a chance encounter that turns poignant and when he wins, she gives him her card. Max’s next ride is Vince who offers him a tempting flat fare of $600 to transport him across town to various assignations all night. He seems like an alright type so Max accepts and before too long bodies are falling out of windows onto his cab. Thank heavens Mark Ruffalo arrives on the scene as Agent Fanning and follows their trail like a bloodhound to a jazz club owner (Barry Shabala-Henley), a narcotics boss (a brilliant Javier Bardem) and even to Max’s haranguing, hospital-bound mother (Irma P. Hall). But exactly how many of these people must die before the night’s over? It’s a thrilling gripper and a gripping thriller too. Vince is not just your regular maniac. He’s across the I-Ching and casually quotes John Lennon. He’s also a focused jazz aficionado, ready to view the night as an improvisation to which he and everyone around him must adapt. Vince extracts information from Max about his dream of running a limousine service on a tropical island and challenges him about why he’s not living it. As the night wears on he totally messes with Max’s head but by film’s end, forces him to become the hero that he must be. 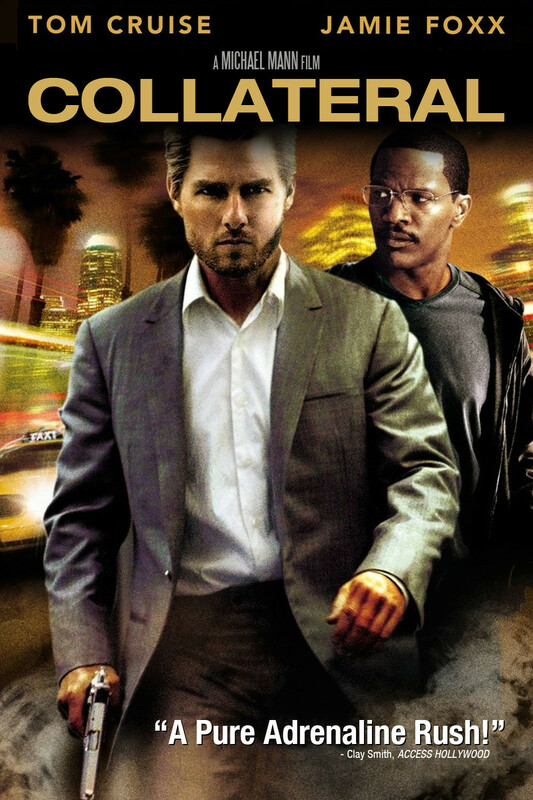 Shot by Paul Cameron and Aussie cinematographer Dion Bebe on HD digital video, Collateral was directed by Michael Mann, who has been described as someone who prepares like Rembrandt and executes like Picasso. With a $65 million budget, you’d hope so! 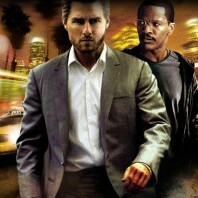 Cruise is wonderfully creepy in this role even if he does go a bit off the rails at the end. Foxx was Oscar nominated in the supporting actor category and Jim Miller and Paul Rubell were tipped for their flash editing. There are no opening credits with this one, just straight into the story for a dirty downtown look at the underworld on and above the streets of LA after dark.